News: Former Prime Minister Mahinda Rajapaksa has reportedly taken his magic back into the presidency. The magical score was the most famous one in that period. After Mahinda's appointment as PM again, he has started using his magic goal again. The photographs taken when used on the Internet are released. 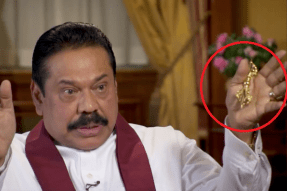 This magical cue was specially prepared and given to Mahinda by the sorcerers in Camaro.